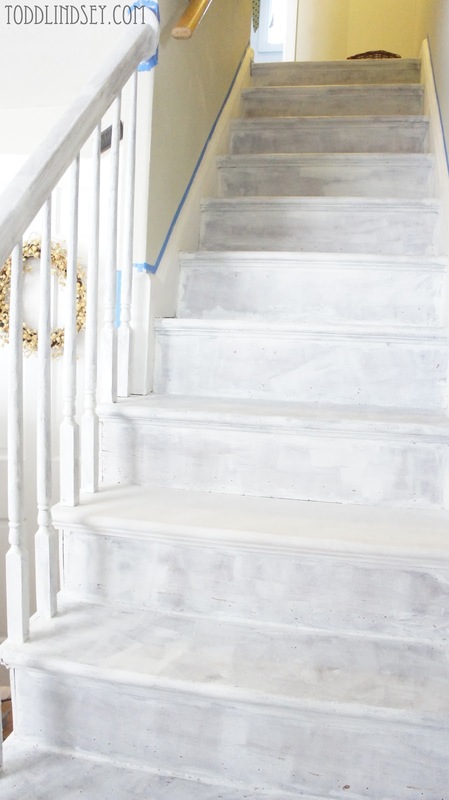 I know I just shared our $400 Kitchen Reveal but I have yet another exciting reveal to show you! You may not think it's such a big deal but for Todd and I, this was a long time coming! After a few months of living in our house by myself, Todd and I met. I immediately gave him the task of removing carpet from the steps. (What a test, huh?) 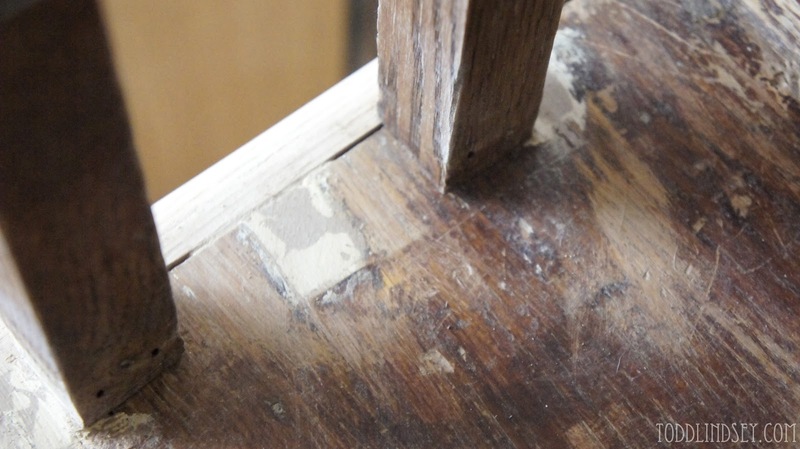 Don't get me wrong, I like a good DIY challenge but I just didn't have the muscle for this job. I removed all the carpet (and staples and nails) from the entire upstairs by myself but I just didn't have the strength to pull out the three inch long nails and mega staples that tacked the carpet into the wood steps. 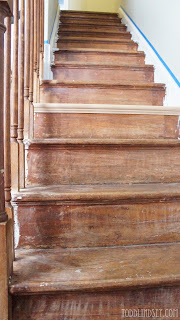 Of course the stained and distressed wood steps were a huge improvement in itself over the nasty maroon carpet. And I should also mention that it took a good two years or so to get all the carpet and staples up. Todd even had two friends, Sean and Fontaine, help him out. 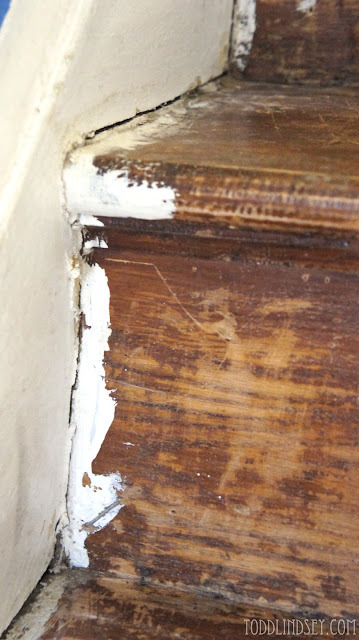 Since the house is so old, a lot of the wood trim was in disrepair. 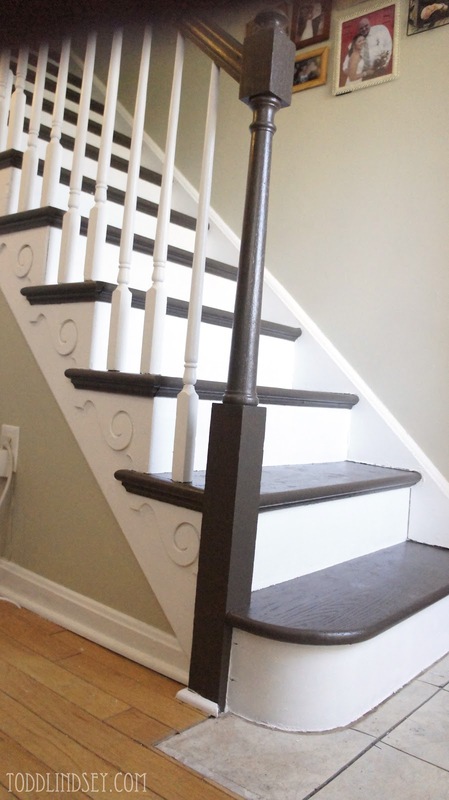 We hired our good friend and trusty contractor, Joe, to replace a split step and some edge trim that I just didn't want to deal with. 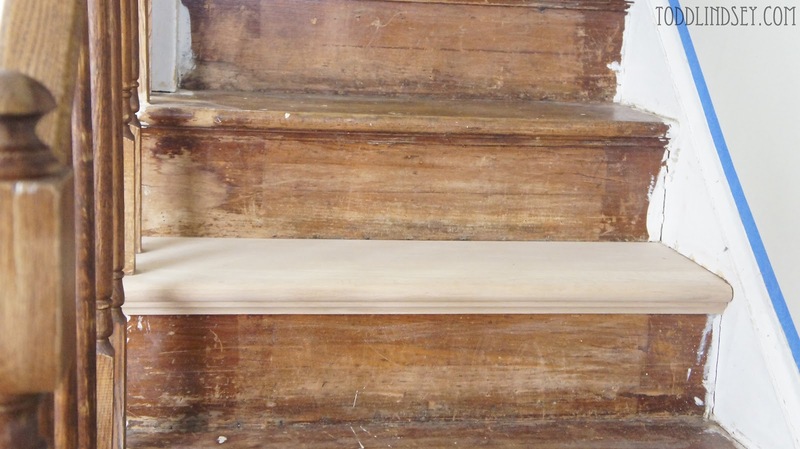 For my Valentine's Day gift this year, Todd (and Fontaine) sanded the entire staircase and railing for me. :) Not sure why they didn't use the electric sander so these guys did it allllllll by hand. Wow. 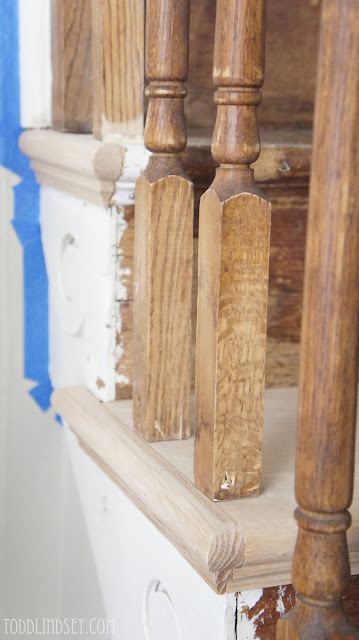 Todd also filled all the gaps made from a previous railing with wood filler. He also sanded them nice and level. Now since the wood was in pretty banged up condition, I decided to use paint instead of stain. 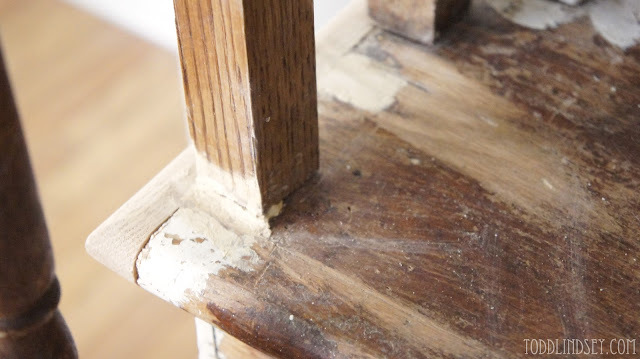 I thought that stain would show all the imperfections and filler. 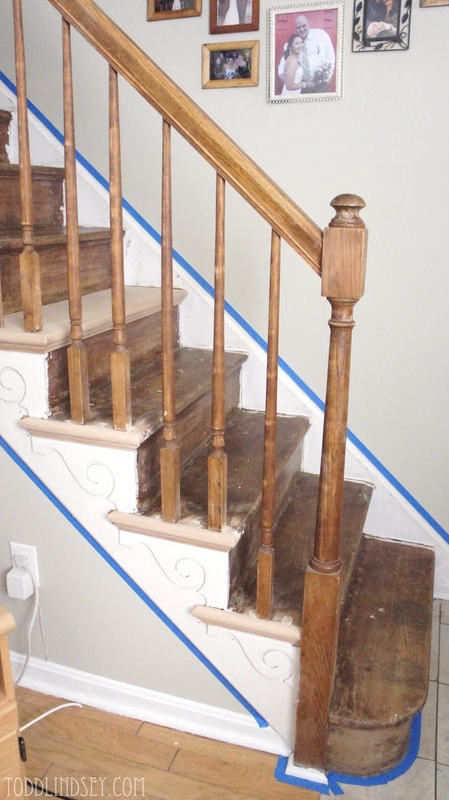 Plus there was a lot of old paint that just wouldn't sand off by hand. Once I taped everything off, I was ready to prime! I used half a quart of Zinsser primer. Toxic yet effective. Unfortunately, after I applied a coat of primer, I realized that all the tack and nail holes were going to show up. Oh no! I did the totally incorrect thing and filled them with spackle. I probably should have used wood filler. Oh well. But I didn't. 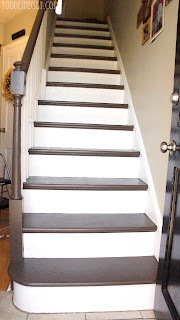 I had already purchased my Swiss Chocolate brown paint from Valspar... Mhmm... After more taping, the treads and railing got two coats of this silky brown. 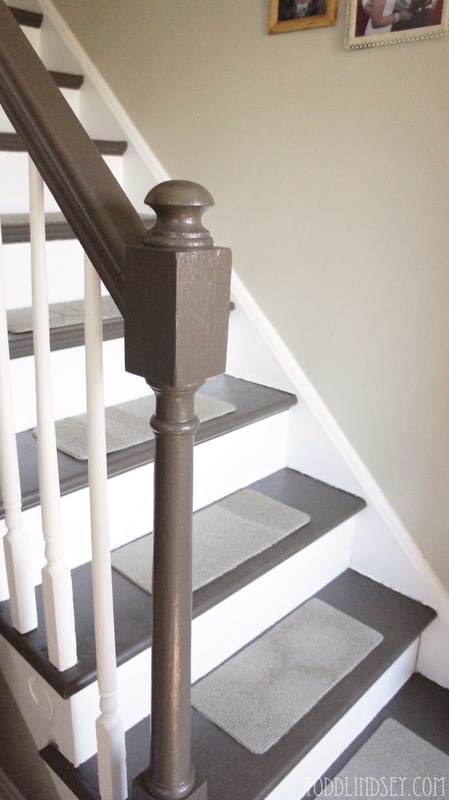 I just love how it goes with our wall color, Cliveden Gray Morning from Valspar. After the chocolate dried... 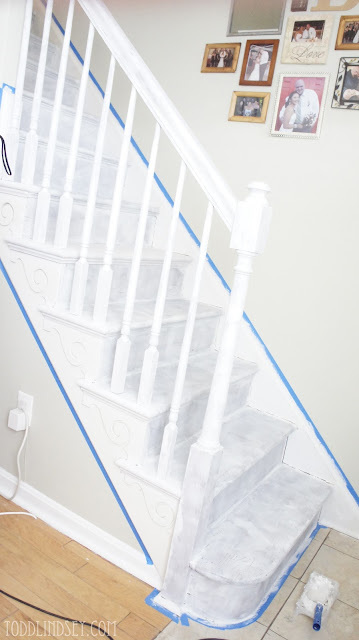 I mean, brown paint, I used my second roll of tape to prep for some nice crisp white. 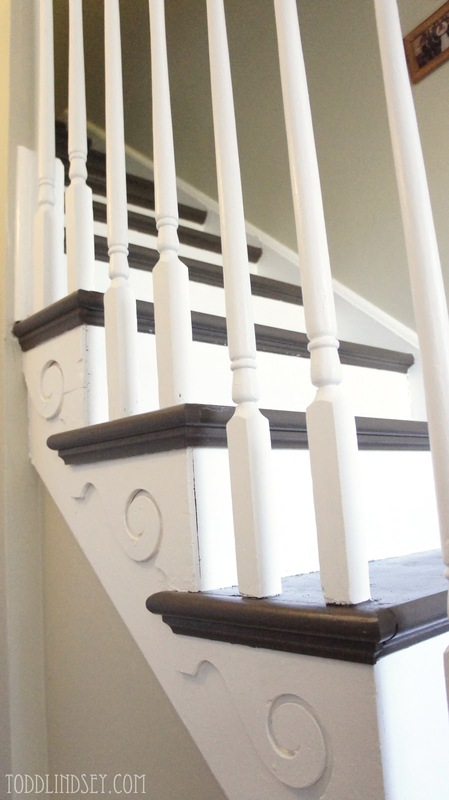 I used two coats of white on the risers, spindles and nifty scroll trim work. And... AHHH!!! Finally complete! I have been waiting three years for this!!! 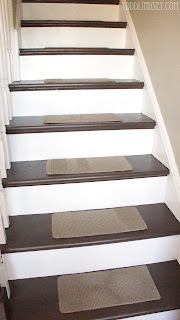 I put some little rug treads on each step to help with wear and tear. So far (*fingers crossed*) the cats haven't used them as a scratching toy. But even if they do, they were only $10. I remember they were one of the first things I bought the week after I bought my house... three years ago. 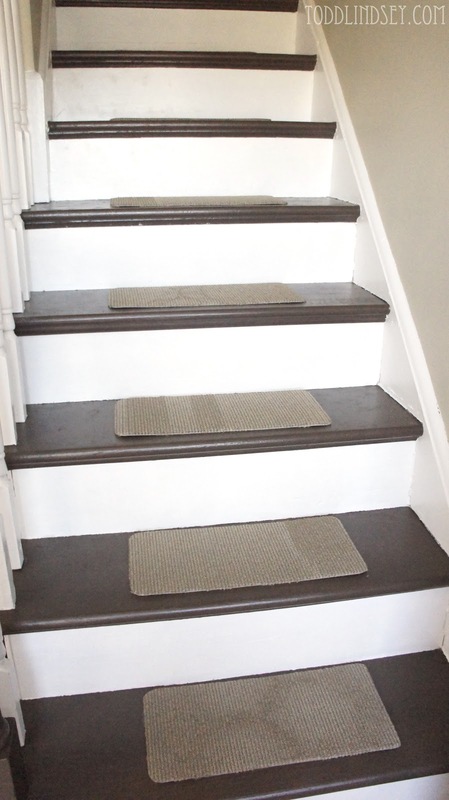 Right now the rugs are just sitting on top of the stairs. The glue on the back seems to be preventing them from slipping but if they do start to slide, Todd and I will either nail them in or use some peel and stick carpet tape I have. 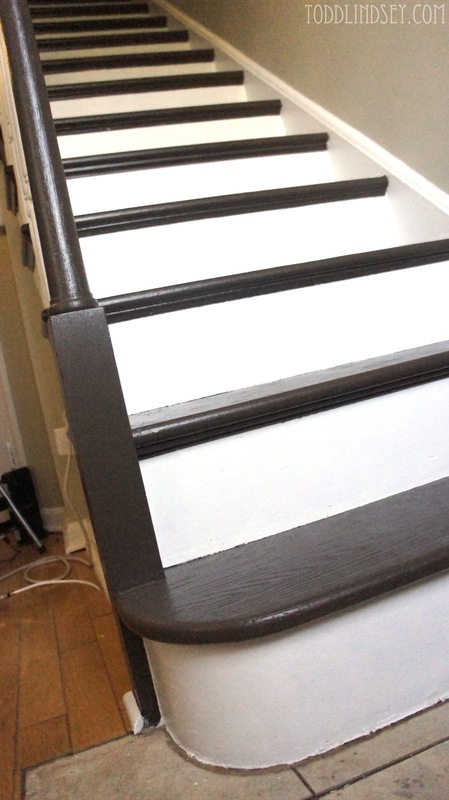 On a side note, I used a satin finish on all the paint. I asked for glossy for the brown since it would get the most wear and tear however the guy at Lowes got a little confused. Or just didn't listen. Unfortunately, I didn't notice until I got home and started painting. If the paint doesn't seem to hold up, I will do some quick touch ups and then put on a coat or two of polyurethane. * Everything else was on hand... Including blood, sweat and tears--- Of which there was plenty of each. I love it!!! Looks so bright and fresh! A major improvement and for such a sweet price! That looks gorgeous! The transformation is out of this world!!! Great work...I and the price!!! WOW!!! You rocked it girl! oh my gosh- what a difference! All that hard work was definitely worth it because it turned out gorgeous! 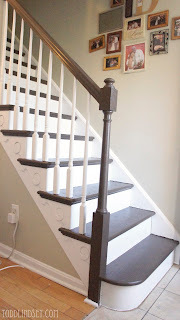 Do you have an alternate way to get up stairs? or did you do this all in one day?! 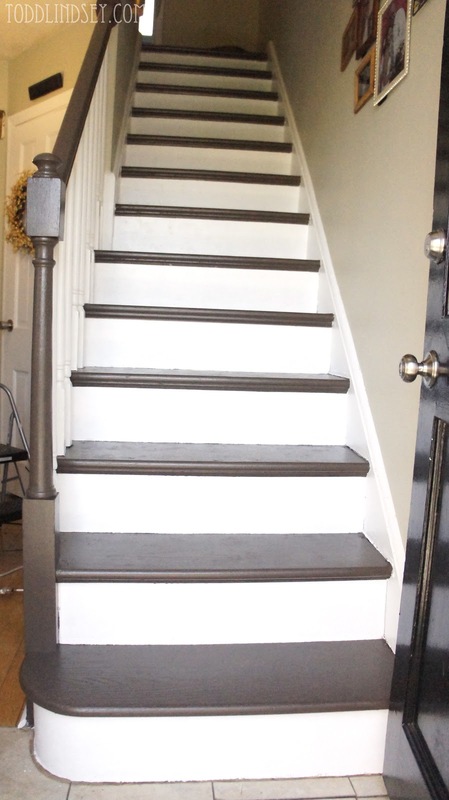 I love your stairs ~ they look gorgeous. What a transformation!! Looks great! Thanks for linking up at our Pinterest Power Party! Really clean and fresh, I love the old curlicue molding! It's awesome and the price can't be beat! Wow! Love how your staircase turned out. Its beautiful! You guys did a great job! Wow! 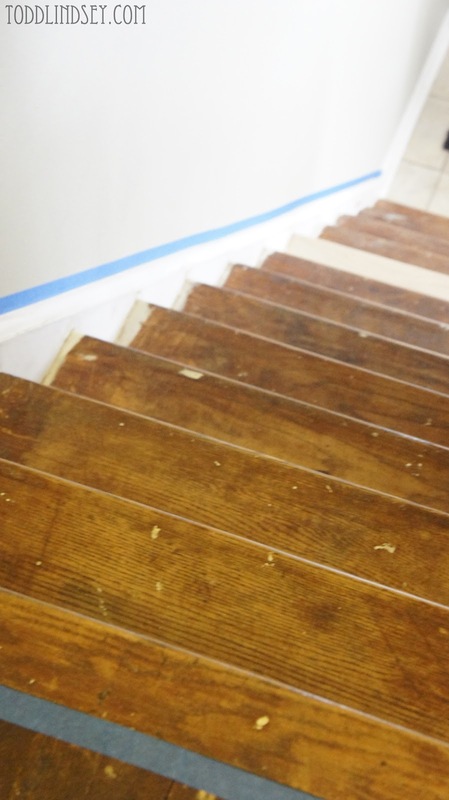 I can't wait to rip up our carpet! Thanks for sharing at the Give Me The Goods Link Party! Beautiful! Great job and worth all the work. Looks Beautiful!! :) Visiting from Market Yourself Monday! blessings! 100% improved. They look clean and smart now. What an update. Flagging this as inspiration for my stairs this fall! $42, for real??? Love the change in color. And the price to boot. Sharing this at Creative Juice this evening and at Pinterest. What a fantastic change! Great price for a great DIY project! Thank you for linking up to the In and Out of the Kitchen Link party! I look forward to seeing your next great project or recipe! Fantastic makeover!!! They look beautiful! What a beautiful transformation! And so thrifty too! Your all the stairs are awesome and i really like brown wood stairs.